Why I’m Marching: at home and abroad – international solidarity. 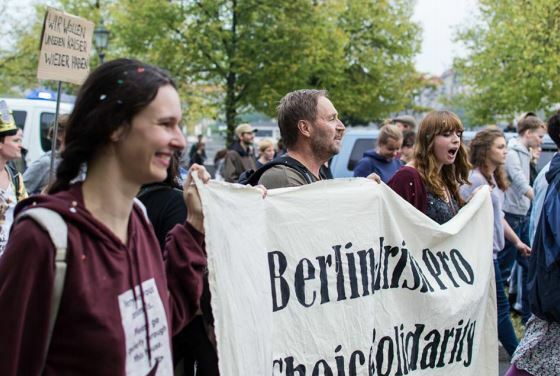 Before I came to Berlin I had always been passionate about expressing my pro-choice views. I can’t remember a time when I hadn’t believed it was a woman’s right to choose when it came to abortion – it was something that came naturally! It also helped that all my friends had always been very pro choice – it just seemed like common sense to us, and that was a long time before any of us self-identified as feminists. As the years went on, more and more people I knew came up against the rigid and backwards laws that continue to control women’s’ bodies in Ireland. It had become more and more frustrating and then…those infamous Youth Defence posters appeared in the summer of 2012. That was it; that was the breaking point for me and for many others. Debates started on Facebook, people connected over it, plans were made, groups were set up and a movement began to take shape. 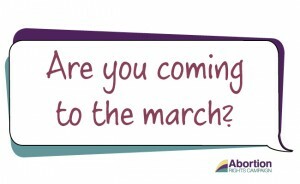 My sister, a couple of good friends of mine and myself decided to go up to Belfast for the counter demo for the All Ireland Rally for Life. Since then I’ve tried to attend every pro-choice protest and march I could. 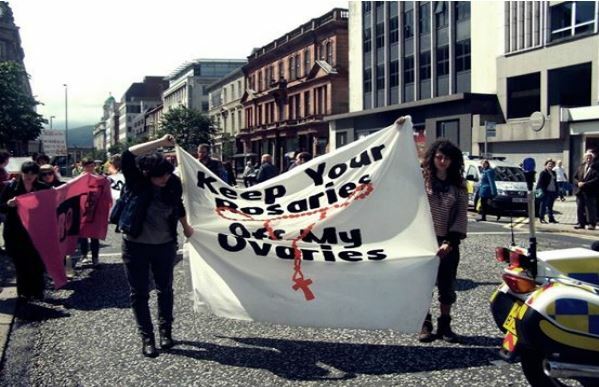 Counter demo for Rally for Life, Belfast 2012. Two years later I find myself in Berlin, helping organise a small Berlin-Irish pro choice group with two other Irish women who set it up after news of the tragic death of Savita Halappanavar spread throughout Europe and the world. They stood outside the Irish Embassy in November 2012 and said “never again” unfortunately we found ourselves taking to the streets once more when the shocking news of Ms Y broke. Berlin-Irish Solidarity protest outside the Irish Embassy, Berlin August 2014. Two years after my first protest, I found myself again at another counter demonstration, still facing people who would force their “morals” on to women and take away what rights they’ve fought for and won. I had never seen anything quite like this counter demo – everyone was holding a big white cross! Police in riot gear stood around menacingly – something protestors in Berlin seem to be well acquainted with, but always a bit of a shock to an outsider. 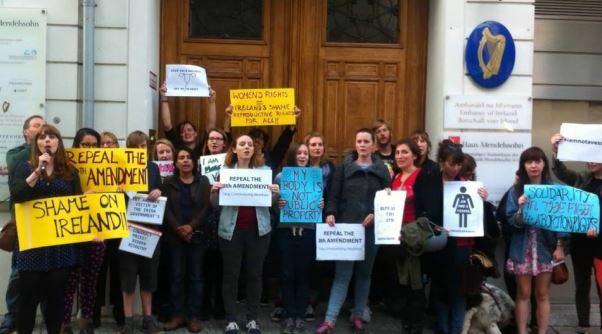 The German pro choice activists gave it their all, chanting “Kein Gott, kein Staat, kein Patriachat” [No god, No state, No patriarchy] and defiantly sat down, successfully blocking the path of the (notoriously) sexist, racist and homophobic Christian fundamentalists. However, it wasn’t long until the police began to roughly grab and blatantly use force against the activists – I couldn’t believe my eyes, but the pro-choice activists continued undeterred. We marched in solidarity with German women, Spanish women, Polish women, Irish women – for women everywhere who’s right to choose still seems to be under threat. More than ever I think it’s important for women to connect internationally, to help each other, and to learn from each other about how we can fight for free, safe, legal abortion for all. 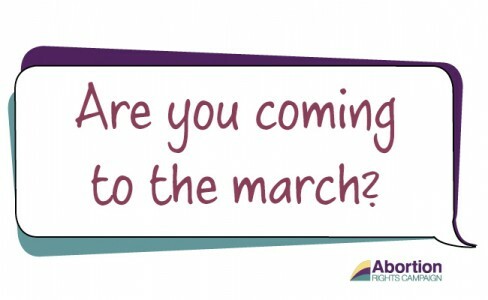 I’ll luckily be back in Dublin briefly to attend the March for Choice on the 27th I look forward to seeing some familiar faces and hopefully a lot of new ones too! Lorna O’Hara is a feminist-activist and PhD student from Dublin, currently living in Berlin.